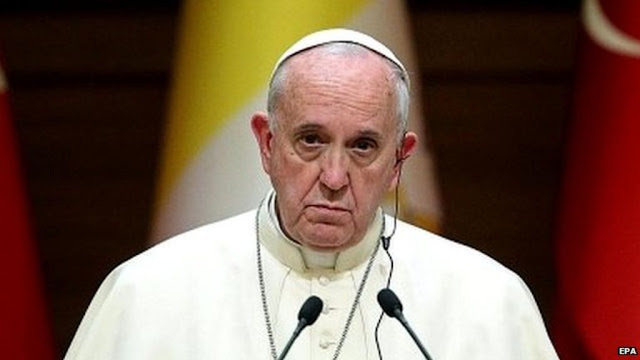 The Pope has on numerous occasions called for dialogue with our culture. What does it sound like? I thought that Fr Alexander Lucie-Smith of our Diocese and of the Catholic Herald did very well indeed, under great pressure, in answering with conviction and charity a rather hostile interviewer for a radio station in Northern Ireland. I was impressed because while the interview was ostensibly about the DUP, their opposition to planks of the great social engineering projects of the liberal movement and about the DUP's new role in propping up Teresa May's Government, it became quickly an interrogation of a Catholic priest committed to defending the Church's teachings in the public square. This is the kind of public grilling that the vast majority of bishops and clergy would very much like to avoid. For confronting with patience and understanding a culture set against Our Lord Jesus Christ and His Church, Fr Lucie-Smith ought to be commended. The question is, would he be commended by most prelates nowadays or would most bishops be disappointed in his responses, since the priest even spoke of 'moral absolutes'? Quite what Pope Francis would make of the interview - the forthright but charitable explanation of the truths of the Catholic teachings, or what the majority of the Bishops of England and Wales would make of it, I would rather not think about, but it has to be said that the interview highlights quite well the simple truth that if the Catholic Church is to dialogue with the world successfully - or rather, meaningfully - then Her ministers, evangelists and apologists must do so from a position of confidence in the teaching and Person of Her Lord. It seems to me that much of the 'dialogue' the Church encourages nowadays comes from a position of doubt in the Church's teachings. It has been said that overwhelmingly the message one receives from this pontificate is that doubt is the new faith, except perhaps in the realm of obedience to the Successor of St Peter, which is one article of faith once ignored by a great many (see Summorum Pontificum) but now given great prominence by a class of dissidents who find themselves in positions of unrestrained influence and power (see Amoris Laetitia). It should be apparant from the interview that when the Church speaks confidently concerning sin, our need for repentance, of our need for God, of the love of God, of God's love for us, of our dependence on God, when the Church articulates the Gospel in the firm belief that it is absolutely true, its enemies may not find themselves unable to resist it, or argue against it, but certainly experiences great difficulty in articulating that resistance. While the interviewer made several attempts to cast Fr Lucie-Smith as being 'against equality', utilising a rhetorical device of splendid propaganda value to smear the reputations of those who refuse to burn incense to the false idols of our age, the priest's armour remained undented in my opinion. The main reason for this is because the priest clearly believes what the Church teaches and is able to express this in ways that are reasonable and understandable. The interviewer seemed at times to revel in the credentials of Fr Lucie-Smith. I lost count of the number of times he reminded his audience that he had a moral theologian and consulting editor of the Catholic Herald on his radio show, but it goes to show that we have reached one of those intellectual and spiritual low points in history when it is believed that a moral theologian is needed to point out to the general public - or even to the Catholic Church itself and its leadership - that marriage by necessity requires a man and a woman for the procreation of children and that the killing of nascent human life in the womb is reprehensible and morally wrong. Any rational human being, even while ensconsed in a tumultuous time in history, with so many messages to receive about what is good and what is evil, should be able to discern this and, failing that, the Catholic Church should have the confidence to proclaim it. I am quite certain that individual Catholics would pick at a few points made by Fr Lucie-Smith and rake over their theological weight, but I think that we have to ask the question why it is that even a Catholic caller to the phone-in afterwards, while unable to articulate his anger at the positions laid out by the priest, noted that 'we have never heard anyone in Northern Ireland say anything like this'. That itself points to a crisis of faith in the Church and among the clergy and episcopate in that part, but not only that part, of the United Kingdom. All that the first caller could criticise was Fr Lucie-Smith's 'attitude', the interviewer himself pointing out to the caller that it is logical that a Catholic priest should defend the Catholic teachings of the Catholic Church. The 'attitude' that is hated - and the Pope probably knows this well since it is apparent he is not too keen on it himself - is that attitude of supreme trust, faith and obedience to Jesus Christ. Ever since the first rumblings of the Synod began in earnest, it is this attitude of trust, faith and obedience to Jesus Christ and confidence in Him and His teachings which has received scorn, insult, mockery and even contempt from the Pope and with even less charity from his entourage. In so many ways, from within, the Catholic Church is under seige, more so from within from without. The world, in its hopelessness and distance from Christ, wishes very much for that world to be guilt-free and for every immoral impulse, even those that go against nature, to be hailed as natural and honest and pure as sunrise and birdsong. Many senior and not so senior figures in the Church wish this to be the case as well. The world has always hated and persecuted those who even with charity and patience oppose the great sins of the age and refuse to speak the world's deceptive language. May the Lord raise up more in His Church who will through the kindness and clarity of their words, with faith point to Jesus Christ, enabling men to hear the good news, the news which we believe with great confidence and trust, because Jesus Christ is truly trustworthy, more trustworthy indeed, than any prince in the world or even in the Church. May those who stand up for Jesus Christ and His Church with confidence in Her Lord receive reward and the blessings of our Risen Saviour and the support and blessing of the Bishops and their brother clergy. Well said Laurence!Yet again the Truth is being dissipated by a hostile Heretic of a Pope and Cardinals.The world hates us but let us thank Fr Smith for his sterling defence of The Truth unlike Bergoglio and his minions who would like us to swim with the stream as opposed to being Faithful to The Mystical Body of Christ.Fr Smith was up against it ,as you say,but he fought back against vitriol. You and Father Lucie-Smith are clearly the kind of Catholics the Church needs, though perhaps does not want. Thanks Bones for the link. And bravo to Fr Lucie-Smith for taking up such a challenging interview and surviving well. I was surprised that the interviewer appeared to refer to him at least eight times as Fr Alexandra! The only comment I disagreed with was when Fr ALS said that 'we have got 70 years on this planet' having passed this milestone some time ago. I forgive him of course but it did come as a bit of a shock although when I last looked I was still alive! Excellent response from Father Alexander. The first of the follow up calls was from a somebody who claimed to be Catholic but was utterly incoherent as to what he objected to in Fr Alexander's response. The second Catholic caller said we should 'live and let live' but was oblivious that that hardly squared with his support for abortion! Well said the Church, not Bergoglio's one, this guy is the Bishop of Rome, Popes are very different.....F.r Lucie-Smith is a great man and priest, God bless people like him.Thanks, Mr.Bones. This was great to listen to, so thanks very much. I happened to have come across your blog and another today that links to Fr. John O'Connor giving a talk about the homosexual infiltration of the Catholic Church. When he began speaking about just what homosexual sexual acts, I had to stop the lecture. This, in my opinion, is how they initially got their foot in the door -- they left out or hide the discussion of their perverted sexual acts, and appealed to the "love" they share with one another. The interviewer was heavy on this type of appeal. It, like all of the sexual perversions, is a denial of truth and man's purpose/end. The same about abortion, appealing to the, "No sympathy toward the girl who is viciously raped?" Of course, then it would be ok to murder the baby? How they have convinced themselves just how good and righteous they are while those unsympathetic Catholics are living in the dark age. Laws and cultures will not become decent again until men's minds regain reason and moral absolutes...choosing the good is the right choice always. Thanks again. Well said Bones. Since when did this mawkish acceptance of the literally impossible (homosexual 'marriage') and brutal indifference to the murderously sociopathic (mass abortion) become considered a normative value? Both these forms of national suicide are now rebranded as 'equality' and 'women's rights' in a sinister distortion of the language, as well as a threat to human life itself. As Orwell has shown, the deliberate twisting of the meanings of words has totalitarian consequences. I shall be quoting your words till my dying day. Trust not in the princes of this world, but trust only in Jesus Christ and Him alone.